The alternative options for school leavers are becoming more pertinent with the true value of a degree hanging in the balance. At this time the question arises whether the job seekers are getting the best guidance or not? Getting the best advice to young job seekers is no easy feat when there is an abundance of views from different people. The new lot is often guided to approach a recognized company for getting a progressive start, but in the eyes of a former LinkedIn VP of Talent and Founder, it isn’t so. 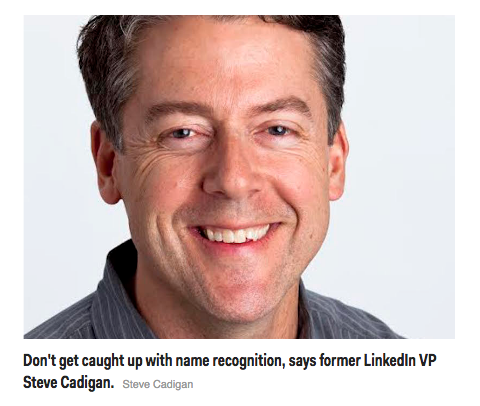 Steve Cadigan of Cadigan Talent Ventures and digital business school ISDI, states that the upcoming job seekers are focusing particularly on getting a job at big companies. According to him, it’s because they considered it a high standard to work in notorious companies. But Cadigan says it is more important to focus on who you are working for rather than thing where you work. He suggests that young job seekers should search for a company where they think they can learn and grow their skills. That’s because sometimes in well-known companies, people are forced to work with leaders they fail to collaborate with. Whereas working in an ordinary company sometimes gives the opportunity to work with leaders who are true leaders. The only good start an individual can get is to start working with a company where there is a bigger margin for to grow as a professional. The search for such a company is simple; you just need to find people who you know are the best for their work. The boss should be a big source of motivation for its employees who encourages them to learn and grow their skill set. A good boss will assign you the work he/she thinks you are eligible for and find ways and will provide you with opportunities to advance in your career.